Wine prices: How low can you go? How much does a bottle of wine cost? That depends. 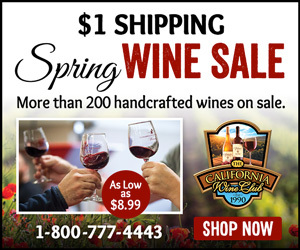 Handcrafted, small-batch, artisan Cabernets, Merlots, Pinot Noirs, Chardonnays and more are on sale now at The California Wine Club. Save up to 60% on every bottle of small-batch wine plus save up to $38 in shipping on every case. Domaine de la Romanée-Conti from Burgundy’s Cote de Nuits, France, the average price of a bottle from all vintages is a cool $17,686, reports Wine-Searcher.com, while the most pricey bottle of DRC currently showing up at retail or auction in Wine-Searcher’s files is $51,790. Yes, about the same price as a new Chevrolet Suburban. I think I’d just as soon have the wine. At the other end of the economy scale, Wine-Searcher reports an average price of $1 for a bottle of Garriguella Rosat Vi de Taula Garnacha Rosé from Catalunya. Yes, just a buck, same as a cheesy bean and rice burrito from Taco Bell. Again, I think I’d just as soon have the wine. It probably will not surprise you to learn that a bottle of wine, on average, is priced quite a bit closer to the burrito than it is to the gas-guzzling behemoth. To be exact, the average price for the equivalent of a standard-sized 750-milliliter bottle of wine sold by U.S. retailers is $10 a bottle. The average hit double digits for the first time about a year ago, according to the North Bay (California) Business Journal, quoting Danny Brager, senior vice president of Nielsen’s Beverage Alcohol Practice, at last year’s Unified Wine & Grape Symposium in Sacramento. A particularly pricey bottle of Romanée-Conti might set you back as much as a new Suburban. Which would you rather have? What’s your sweet spot for wine spending? I’d guess that most of us aren’t going to be uncorking Romanée-Conti anytime soon, but I imagine that most of us are just about as unlikely to carry out a bag full of dollar wine. Most of my wine buying these days falls between $10 and $20. Above that mark gets into “special occasion” territory for me, and, while I recognize the gains in subtlety, complexity and balance that should come with higher prices, I can also make the case that diminishing returns set in at some point. I don’t think it’s a sure thing that a $100 wine will be objectively ten times better than a $10 wine, but a $10 wine might actually be twice as good – or possibly more – than a $5 wine. What’s wrong with cheap wine? Given that fine wine requires time-consuming, hands-on efforts in the vineyard and in the winery, it makes sense that there’s a price floor below which a cheap-wine producer can’t afford to invest in quality. Still, I’ve had plenty of wines around $10 – and a random few for less than $10 – that fully meet my criteria for enjoyment, so I can’t write off the single-digit category entirely. Neither should you. Starting March 1, we’re going to gear up a quest for over-performing wines under $10 in our WineLovers Discussion Group’s monthly Wine Focus. I got off to an early start with a surprisingly good French white, Domaine de Pouy 2016 Côtes de Gascogne. This Southwestern French blend of Ugni Blanc and Colombard is priced locally at an inviting $7.99 for a bottle, but can compete in quality with a wine at double that toll. My tasting notes are below. During the month, we’ll invite you to nominate your favorite cheap wines and share new discoveries. To get us started, here are Wine-Searcher links to vendors and prices for a half-dozen $10 wines I’ve reported on during the past few months. Please tell us about your favorites! Save up to 60% on every bottle of small-batch wine plus save up to $38 in shipping on every case. More than 200 artisan wines on sale, and every bottle is backed by their Love It guarantee. Don’t wait! Wines will sell out quickly. FOOD MATCH: The back label declares it a perfect aperitif, good with salads, seafood, fish, tapas and, generically, “Asian food.” It was fine with the slightly sweet flavor of mini crab cakes. WHEN TO DRINK: It’s not a wine for aging. Enjoy it while it’s young and fresh, then move on to newer vintages. Don’t fret, though: The sturdy metal screwcap will keep it from going around the bend before you get a chance to drink it. Wine-Searcher.com’s average retail price is $10, but it’s available at many vendors for $8 or less. It’s hard to find a better wine for single-digit prices in today’s market. Remarkably, I paid the same toll for the 2006 edition of this wine more than a decade ago, so it’s been a real hedge against inflation. Here’s a fact sheet on Domaine du Pouy from distributor Domaine Select. 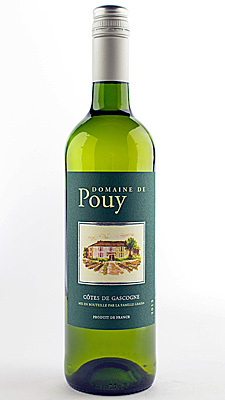 Check prices and locate vendors for Domaine de Pouy 2016 Côtes de Gascogne on Wine-Searcher.com.